Like most Irish people this morning I'm gutted that the Irish football team have failed to qualify for next year's World Cup. It was a wonderful game to watch, with Ireland dominating much of the match and taking the lead with an excellent Robbie Keane goal (32 mins - see it here on YouTube). It was long wait to the end of the game, but Ireland were worthy winners of the game in normal time. 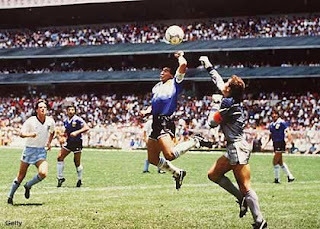 It all ended in extra time with "The Hand of Gaul" - as Thierry Henry made an excellent hand pass that would be praised if it was in a Gaelic football match in Croke Park. Even Henry admitted it himself - Oui, il y avait main. Now there is much discussion in the media this morning about this - "France/Henry cheated" is the jist of it all. Had Ireland won in similar circumstances we would be passing it off as "cute hoorism". I don't really think that video refs are the answer - players will always try to get an advantage by fair means or foul. Duff goes down very easily to win free kicks - remember his dive vs Spain in the 2002 World Cup? (perhaps justice was done then when Harte missed the ensuing penalty). The Ref should have spotted Henry's hand on the ball, but McShane (in the picture above) should have prevented the cross, and Gallas was given an easy header to score - we were not properly organised for the free kick that preceded the goal. Very sloppy defending contributed to the goal just as much "The Hand of Gaul". Honesty is a quality demanded in most professions and in our personal lives. We all hate cheats no matter what, but I guess we all cheat at least a little sometimes. Sport is riddled with cheating - drugs, hand balls, and even "ordinary" fouls are all cheating. It will never go away.